The fi-7160 is one of the first desktop scanners in the world to offer paper protection by detecting irregular noise. Pairing this technology with advanced hardware and software boosts your productivity. scanner networks to multiple remote locations. Building on and incorporating the market-proven paper protection mechanisms of previous fi Series scanners, the fi-7160 introduces an additional market innovation for safeguarding any paper documents. 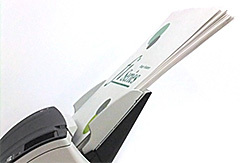 By listening to the audible sound of paper movements, intelligent Sonic Paper Protection automatically suspends paper feeding if an irregular noise is detected. This advanced Paper Protection feature reliably reduces the risk of damaging documents during scanning. Built on TWAIN / ISIS standards, PaperStream IP is the scanner driver for Fujitsu fi Series image scanners. With its advanced black and white and colour processing, a range of documents can be automatically and easily converted into image data suitable for complex post capture processing -producing for example highly accurate OCR results. High quality image data can be created without defining scanner settings in advance, as PaperStream IP will aim to optimise this automatically for every sheet.